After working hard to maintain a beautiful landscape and home, it can be frustrating to find out that you are currently housing a rodent. Gophers and moles love to live in the cool dirt below your yard or garden. If that’s all they did it may not be so bad. Unfortunately, harboring one of these rodents means they have a food source nearby (your yard). In addition, the tunnels and mounds they make in your yard are an eyesore. Boarding one of these pests on your property can destroy the tranquility you have worked hard to maintain and expect from your home. Repellex understands the hard work you have put into keeping your home looking beautiful. We also know that you don’t want to dump a bunch of harmful chemicals into your yard, which can be dangerous for children, pets, and the food you grow. That’s why we have created several products that help you keep gophers, voles, and moles away from your home. 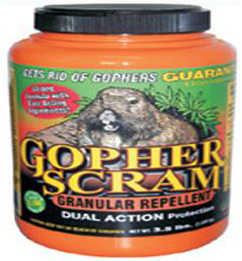 Our products work as a home remedy gopher repellent. These products are safe and effective. Each one works into the soil to protect your garden or yard by creating an uninviting environment for these rodents. When applied to your yard, these products will create a barrier at the root level that is safe for your plants. The Ready-to-Spray mixture is great as an initial application to repel pests fast. The granular and tablet products last longer than the spray, but does take longer to start working. For a solid defense, try using our Ready-to-Spray mix first and then supplement it with our granular or tablet options after your initial application to keep the rodents at bay. And because Repellex uses natural ingredients, you can be assured that using this product wont be harmful on your yard. With no harmful pesticides or chemicals, you can feel safe using this around children and pets. Please be aware that Repellex is not to be used on edible plants. Each product is effective in getting rid of moles in a way that is safe for dogs now by checking out here. This entry was posted in Home Protection and tagged protection from rodents on July 24, 2013 by Yami.